These fabulous Punta Cana attractions in Dominican Republic will appeal to all ages and tastes. Nature lovers will be enchanted by protected parks that showcase exotic flora, fauna and magnificent scenery. Visit venues created especially for swimming with dolphins and sharks. 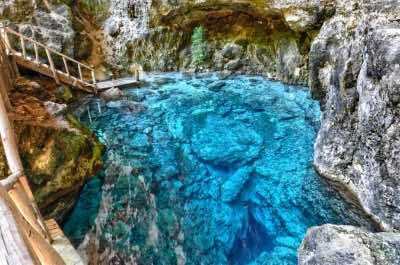 Dive from a cliff into a sparking blue lagoon and explore a hidden cave filled with stunning stalactites and stalagmite formations. Sail off to an exotic tropical island away from the crowds and then come back to party all night at the famous Coco Bonga! Here is a list of our not-to-be-missed Punta Cana points of interest. One of the first Punta Cana attractions to visit has to be the beautiful Parque Nacional del Este. This is also one of the best Punta Cana points of interest that will amaze any tourist. 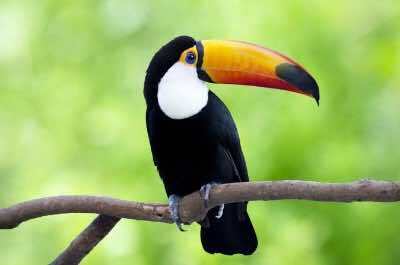 This protected area, designated in 1995, offers a range of natural landscapes ranging from sandy beaches to lush tropical forests. 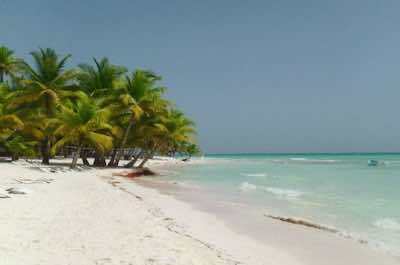 It is located on the south eastern tip of the Domincan Republic and is easily accessible to tourists. Be awed by the stunning caverns and karst limestone landscapes. Walk through the tropical forests and the mangrove forests. There are over 160 different species of birds and more than 500 plants species growing here. This region also incorporates the magnificent Saona Island and fabulous reefs where marine life is abundant. Hike, walk, dive, horse ride and explore, this amazing region has something for everyone. The Marinarium is a fabulous Punta Cana attraction that makes a perfect family day outing. It offers a fabulous environment to see the tropical marine life up close and personal. The amazing reefs are protected in this region and are available for tourists to explore on a range of tours. 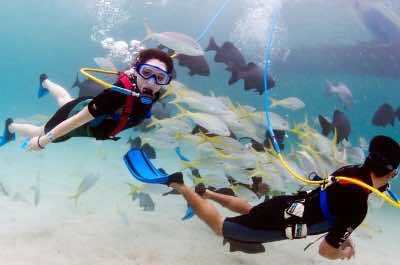 Start with a shark and stingray experience where you will be briefed about these huge creatures, given the correct snorkeling gear and then taken into the water with them.Play with the stingrays and when you feel brave enough, dive down to meet the nurse sharks. It is perfectly safe and suitable for all ages. After your adrenaline rush, relax with a slow kayak ride over the waves and then settle down on a floatation mat with a tropical drink and a snack. Spend a day at another stunning Punta Cana attraction and the best Punta Cana point of interest, Lemon Bay Lagoon. This paradise setting offers world class beaches with pristine white sand, turquoise waters and lush palm trees. This is an escape from reality that will uplift your mind and soul. Lounge on the beach and sip a tropical drink, take a walk or a swim. Divers must explore the beautiful coral reefs that lie just off the coast. Snorkel or scuba dive to discover the amazing array of colourful marine life, corals and sponges. For a fun adventure, take a buggy ride tour to Lemon Lagoon Bay. You will have a thrilling ride through the rice fields before you arrive at the beach. You can also book a horse ride along the beach or follow a guide on a kayak tour. The Fun Fun cave is double fun! It offers a fabulous Punta Cana attraction with a learning experience, an adrenaline rush and some of the most amazing cave formations on the Island. 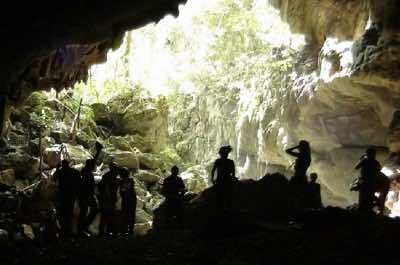 Take a trip with a knowledgeable guide to the Los Haitises National Park where the caves are located. You will repel 65 feet down into the cave using ropes. Once you are underground, you will learn about the history of the cave and the tribes that lived there. See the ancient West Indian rock art and the fabulous natural formations of stalactites and stalagmites. Huge lava columns form underground caverns and a swim in the underground river will enchant. When you exit the cave, relax in the sun on the large rocky boulders. Another Punta Cana attraction that cannot be missed is a visit to the Indigenous Eyes Ecological Park. This establishment is privately run and is named after the lagoons, locally known as 'Eyes'. It covers an area of over 45 acres within the Punta Cana Ecological Park and features the most stunning fresh-water crystal clear lagoons that make for perfect swimming, rowing or walking along the banks. These unique lagoons run underground and merge into the ocean. Take a guided tour to learn about the flora and fauna and the ideology of the Park. If you prefer, stroll along the trails by yourself and enjoy the ambiance of this beautifully preserved region. Visiting a theme park devoted to outdoor pastimes is another fabulous Punta Cana attraction. If you are into horse riding, diving, sailing and other outdoor adventures, this is the place to be. The eco-adventure Park is situated at Cap Cano. Take a tour and learn about the plant life and wildlife and see orchids and cactus plants. 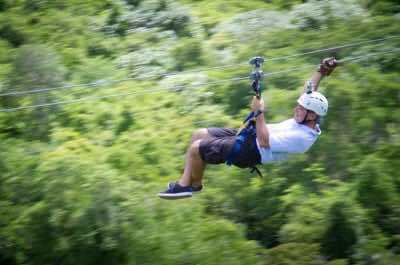 Then get physical and zip across the tree tops on a breath-taking zipline ride. 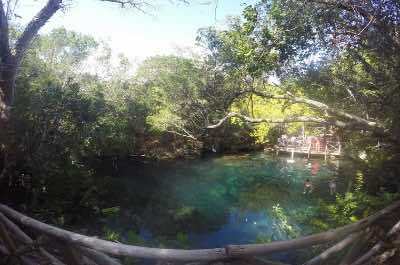 Swim in a giant crystal clear sink hole called the Blue Hole and explore a massive cliff with a wooden staircase. You can take a buggy ride down to the beach and then spend a few hours snorkeling or scuba diving to discover the fabulous marine life and coral reefs. End your day relaxing on a sailing boat. This attraction makes a stunning day out for the whole family and the best Punta Cana point of interest. Nature lovers must visit the beautiful Punta Cana attraction known as the Punta Cana Ecological Reserve. This eco-friendly region is a privately controlled area that preserves much of the natural flora and fauna of the Dominican Republic. The area spans over 1500 acres and incorporates both coastal and inland landscapes. There are over 500 plant species and 80 bird species that live and grow here. Take a tour to learn more or explore on your own. Within the Park is the fabulous Eyes Ecological Park, named for the huge crystal clear lagoons that run underground and enter the ocean, Boat, swim or relax on the banks. Another great option is to explore the Park on horseback. Have you ever dived off a massive towering cliff into a blue lagoon? If not, this is one of the adrenaline rushing Punta Cana attractions. Set off to Hoyo Azul, a magnificent scenic lagoon, known world wide for its magical setting and beauty. The lagoon is located in the Scape Park and you can take a tour or explore alone. Walk along a rugged trail that will lead you through lush tropical forests filled with massive indigenous trees and flora and fauna of the region. When you arrive your breath will be taken away by this huge sparkling blue lagoon lying below you surrounded by sheer rocky cliffs. Sight-see from the bridge, climb down to swim in the water or if you are brave enough, dive right off into the water below! When visiting Punta Cana, Isla Saona is a must-see attraction. It is a small island lying off the south coast of the Republic. Tours will take you there on a fabulous catamaran or a luxury yacht. Isla Saona is inhabited by no more than 300 people and is a great tourist attraction. Dive and snorkel to explore the beautiful reefs that are home to a stunning colourful array of marine life. 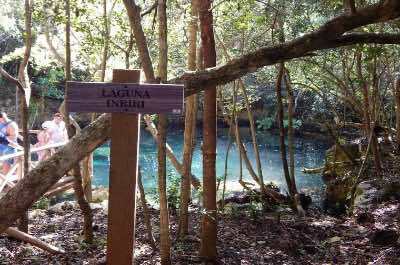 Explore the lagoons and then go underground to see caves and caverns. This heavenly location offers the famous beaches of Mano Juan and Punta Gorda where a swim in the crystal clear waters is a must. The eco-friendly activities make this a perfect day out for the family, a romantic couple or a group. 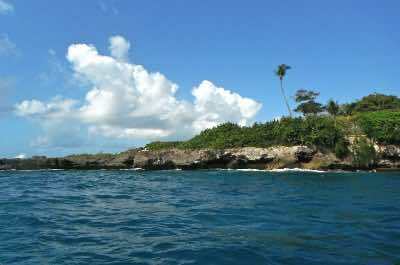 After exploring Isla Saona, set off to another Punta Cana attraction, Isla Catalina! This is a tiny island off the mainland and offers a quiet and relaxing day outing for those wanting total peace in a heavenly setting. Visit by boat and then set off to explore the sand dunes, endless sandy beaches and warm waters. Beautiful reefs offer divers a perfect adventure to discover tropical fish, marine life, corals and even see a stingray. Scuba diving tours are also offered and include a scrumptious meal prepared by local chefs, showcasing the traditional foods of the Island including fresh lobster and exotic fruits. Nature lovers will find an all-encompassing experience at the Punta Cana attraction, Manati Park. This theme park features dolphins, parrots and rare tropical orchids amongst other natural wonders. Take a swim with the dolphins and then relax and watch a sea lion and funny parrots performing a show. A fabulous Taino dancing show will get your feet tapping and teach you about the ancient ancestors of this exotic Island. Explore and discover snakes, flamingoes, colourful macaws and huge iguanas. End your day with a delicious meal at the restaurant and buy a souvenir to take home! Discover Vegas on a tropical island! 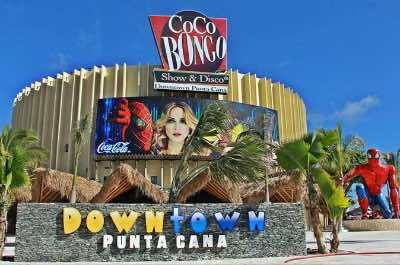 The world famous Coco Bongo Show is one of the iconic Punta Cana attractions. Enjoy a night out where you will be blown away by a mesmerizing show that combines a concert, dare-devil circus acts, a massive disco packed with dancers, trapeze artists, gymnastic displays and re-creations of famous movie scenes. The venue offers all the fun and excitement of a Mardi Gras in an exotic high powered environment. Dance the night way, party, eat and drink until the sun comes up. A tour vehicle will fetch and return you to your hotel. This is a party that cannot be missed! 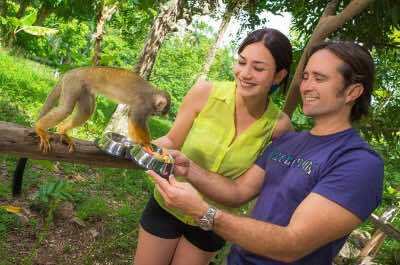 Monkey Land is a fun Punta Cana attraction for the whole family and one of the top Punta Cana points of interest. This venue is located in the Anamuya Mountains and is run by a Canadian couple who have raised and trained twenty adorable squirrel monkeys. The monkeys will interact with you and enthral the kids! The tour takes about 40 minutes and you can play, feed and learn about these friendly and intelligent creatures. Monkey Land tours also combine other exciting adventures like zip lining, a visit to a coffee and cocoa plantation or a visit to a typical local Dominican home. Take your pick. If you are visiting with kids, then the Bavaro Adventure Park is a Punta Cana attraction that cannot be missed. This is the only adventure park in the Dominican Republic and offers 15 fabulous breathtaking attractions. It is only a stone's throw away from the hotel area, so set off and explore. The best way to explore is to join the Adventure Package which offers a choice of 3 activities. You can zipline, ride on horse back, fly planes in the Flight Simulator, try your skills in the Climbing Garden or scream as you drop down the Bungee Dome. For something more relaxed enjoy a Segway ride and mountain biking. Dad and the kids can shoot at one another on the Paintball Course and the whole family can explore Dino World. 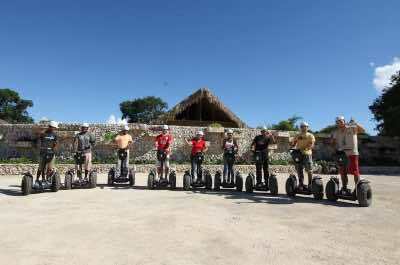 After enjoying these activities you will be taken to explore the natural beauty of the island on a free Eco Tour. Relax and learn about the fauna and flora and take a dip in a natural crystal clear pool. Suitable for all ages, wear closed-toe shoes. 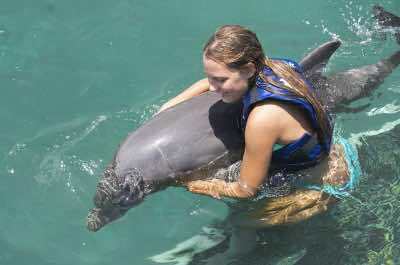 Dolphin Explorer is a Punta Cana attraction where dreams come true! Have you ever thought about swimming with the dolphins? Now is the time to do it. This venue provides a natural setting for these beautiful creatures where you can interact and learn about them. A guide will give you an interesting lesson before you set off into the water. 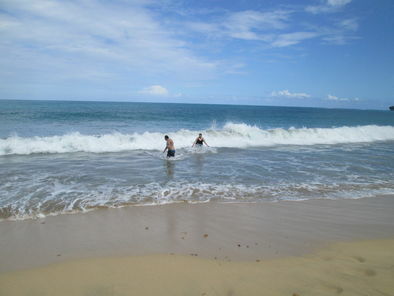 The water is shallow enough for all ages and even those who cannot swim. Play, kiss and cuddle with the dolphins. Swim out into the deeper water and have a belly ride and watch them jumping and dancing. If you prefer to remain dry, a catamaran cruise will get you close enough not to miss anything and you can also see seals and stingrays. If you still want more dolphins, visit the next Punta Cana attraction, Dolphin Island. This adventure also allows you to swim with these amazing creatures in their natural habitat. The venue is created in the open ocean and houses dolphins and sea lions. A professional guide will brief you and then you set off to play, touch, cuddle, hug and swim with the animals. 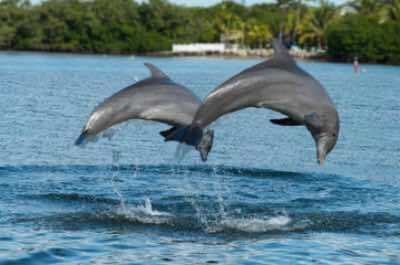 If you prefer to remain on the shore, you are sure to see these fun creatures jumping high out of the water, showing off by dancing, spinning and swirling around! For those who enjoy snorkeling, you will also have the opportunity to get up close with manta rays and nurse sharks.